Nothing says summer like a day at the beach, so Bootie is bringing the feeling of the beach to the Echoplex! Put on your beach attire and get ready to sweat to summertime mashup sounds all night long! Only $5 before 10 PM! 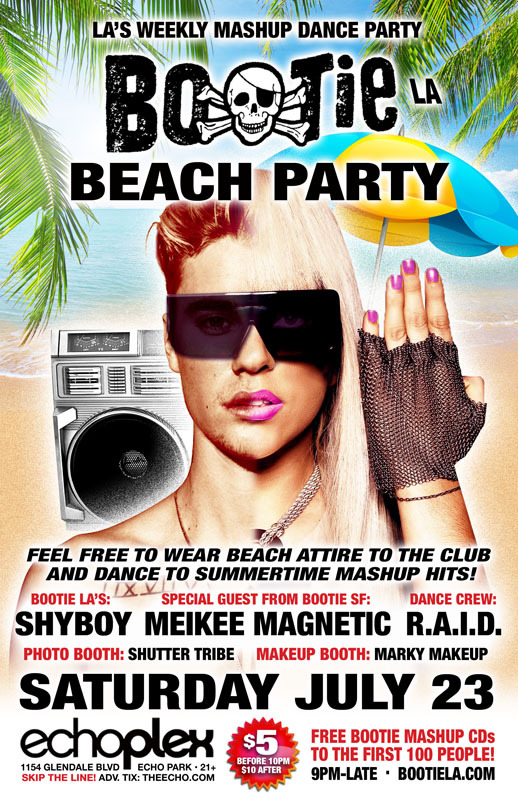 Feel free to wear beach attire to the club and dance to summertime mashup hits! Bootie brings that summertime feeling of being at the beach to the Echoplex! Put on your beach attire and get ready to sweat to the summertime sounds of ShyBoy and special guest Meikee Magnetic from Bootie SF, as they mash up the best summer jams all night long! Resident dance crew R.A.I.D. (Random Acts of Irreverent Dance) throws down go-go beach action to inspire you, Marky Makeup applies artistic sunblock on your faces, and Shutter Tribe captures all the fun! All this, plus FREE Bootie mashup CDs for the first 100 people through the door!